Andes Works! | Bringing Community Together to Build a Powerful Local Economy in Andes. This past Sunday, a great many Andes voters turned out to hear and question the candidates running for Town Supervisor, Town Council and Highway Superintendent. It was an extremely informative event and we thank the candidates and voters for attending. For those who were not able to attend, we are posting the opening comments of the candidates who have provided them to us. I bought my first home in Delaware County on Dry Brook Road in Arkville back in 2011. When I first drove up on 28 I fell in love with the area and knew it offered a chance to get repotted from Brooklyn to live a more interesting and creative life centered in community and nature. I renovated the house and then I met Madonna Badger and that really changed my whole life for the better. Those of you who know Madonna know she’s an extraordinary engaging woman who approaches everything and everyone with no fear and a lot of fun. We both married and moved to Andes in March of 2013 which means I’m coming up on 5 years here in March, making me somewhat of a newcomer. I love Andes and find its dramatic landscape is beautiful in every season of the year. Madonna and I are lucky in that we have an incredible view on Hyzer Hill overlooking Gladstone Hollow. Today sheep are visiting our pasture from Jackie & Joe Evan’s farm and I have to say the view, even with the leaves almost bare, is like a story book. Driving around these hills I feel the area is a deeply spiritual place. The Lanape Indians said it was so spiritual because the rivers flow in all directions. The Andes landscape is unique in that it’s spectacular while being intimate at the same time. I’ve found my life here rich and rewarding, I teach yoga and organize a weekly drawing class and paint landscapes. I also write poetry and regularly play music at on Thursdays at Wayside Cider. I’ve also been creative in business by developing the Willow Drey Farm wedding and event venue, which I’m pleased to say was cash flow positive this year. The venue has hosted several fundraisers for the Andes Food Bank and one for the Bright Hill Literary Press of the Catskills. We also hosted the Andes Central School prom. I love the town and the village. Going door-to door I’ve has a chance to see incredible property and views and also meet so many wonderful and interesting people. So why am I running? Preserving our mountain landscape and the streetscape in the village with its iconic American-build clapboard architecture is very important to me because this is what were selling when we bring visitors and residents to the town. I’d like to keep our taxes down by helping to expand the tax base though residential and economic development. It’s an exciting time for Andes with high-speed internet coming to support young entrepreneurs working from home and cell service on the horizon to support transportation like Lyft and Uber for retired people moving here. I love Andes the way it is, but I’m also feeling a lot of positive change. 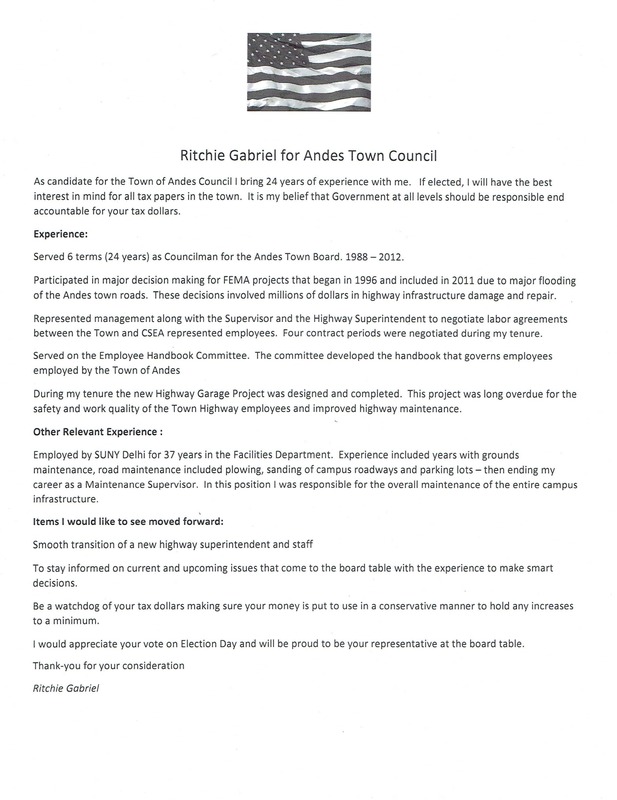 If elected I’ll work hard for you to help grow the town, and our tax base in order to keep our taxes down. Bill is one of the four candidates running for the two Town Council seats. It has been an honor to serve as your Town Supervisor for the past 2 years. Working with the Board, we have maintained tight budget control and anticipate that the budget will stay within the tax cap of approximately 1.7%. We have developed a competitive wage and benefit package for our employees and are working on a comparable insurance plan that will potentially save the taxpayers $60,000-70,000 per year, without sacrificing benefits. Under the outstanding leadership of Highway Superintendent, Mike McAdams, we now have more that 50% of our roads blacktopped or oil and stoned, a 25% increase over the past 2 years, staying within budget to accomplish this. We continue to upgrade our highway department equipment and have purchased a new loader scheduled for December delivery. We have been able to use existing funds of $50,000 toward the $115,000 purchase price. The Andes Business Group/Committee (now the Andes Chamber of Commerce) has played a crucial role in the economic development of our community over the past 2 years. Thanks to the expertise of Peter Ames, we now have a beautiful and inviting Town website. Many people visit our Town each week to hike, shop, eat, stay, look at property and participate in Community events and activities. A good sign of a strong economy. Looking to the future we are working with the MARK Project hoping to secure a $300,000 Main Street Revitalization Grant and working with Cornell Cooperative Extension to secure funding for energy efficiency for our Town Buildings. With the help of several Community members on the Flood Commission Committee, Frank Winkler Planning Board Chair, Delaware County Soil & Water, DEP, Delaware County Planning Department and our Engineering firm, we are looking at options to lessen the risk of flooding within the hamlet at no cost to the Community. After expressing my concern to the NYS DOT regarding the safety concern of children crossing Route 28 at the Andes Central School, I have received a confirmation letter that improved signage, marking and warning lighting will be installed by the DOT in 2018. The County EMS Tower is planned for installation in 2018 on Mt. Pisgah. Once installed, the tower will have the capability to have cell service added to the tower. A much slower process than we had hoped but still moving forward. I would like to thank retiring Judge Joseph Grieco (43 years), Highway Superintendent Mike McAdams (44 years) and Councilman Tom Joyce (4 years) for their hard work and dedicated service to our Community. In closing, I would like to thank everyone who has come to the Board over the past 2 years to express your ideas, thoughts and concerns. Please continue to do so. It has helped guide the board in making many important decisions that affect our Community. I appreciate your continued support on Election day, November 7th.